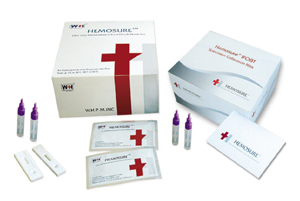 Hemosure® One Step Immunological Faecal Occult Blood Test is a qualitative, sandwich dye conjugate immunoassay and employs a unique combination of monoclonal and polyclonal antibodies to selectively identify haemoglobin in test samples with a high degree of sensitivity. In less than five minutes, elevated levels of human haemoglobin as low as 0.05μghHb/mL can be detected and positive results for high levels of haemoglobin can be seen in the test as early as two to three minutes. As the test sample flows up through the absorbent device , the labelled antibody-dye conjugate binds to the haemoglobin in the specimen forming an antibody-antigen complex. This complex binds to anti-haemoglobin antibody in the positive test reaction zone and produces a pink rose colour band. In the absence of haemoglobin, there is no line in the positive test reaction zone. The pink-rose colour bands in the control reaction zone demonstrate that the reagents and devices are functioning correctly. One test Cassette individually sealed in a foil pouch. Each Test Cassette contains a combination of mouse monoclonal antibodies and polyclonal antibodies (sheep or goat ) directed against human haemoglobin. One Faecal Collection Tube containing 2.0mL of extraction buffer. Stool Collection Paper – 15 x 50cm paper strip with a self-adhesive ends to attach the paper to the sides of a toilet bowl for patient stool collection. The collection strips are printed with both instructions for attaching the collection paper to the toil and how to use the Faecal Collection Tube. The paper and the stool sample can be flushed after use. The above is contained in a reseal zip lock bag. Store test device at 2-30OC (room temperature). The test device is stable until the date printed on the pouch label. If faecal Collection Tube is not used immediately after sampling, it may be stored at 4oC for up to six (6)months or at -20oC for up to 12months. Sensitivity: The sensitivity of the test is 50nghHb/mL buffer or 50μghHb/g faeces. Specificity: Hemosure® One Step Immunological Faecal Occult Blood Test is specific for human haemoglobin. Haemoglobin from horse, pigs, fish, beef, chicken, rabbit, rat, goat, and mouse do not react with Hemosure® One Step Immunological Faecal Occult Blood Test. Aqueous extracts of broccoli, cantaloupe, cauliflower, horseradish, parsnip, raw turnip, and red radish were tested with and without human haemoglobin present in the samples. Additionally, a 20mg/mL solution of horseradish peroxidase, with and without human haemoglobin present, was also tested. No interference was observed. Toilet bowl deodorisers/fresheners, cleaners also did not interfere with Hemosure® One Step Immunological Faecal Occult Blood Test. Accuracy: Reference Laboratory and Physicians Office Laboratory (POL) Studies One hundred (100) hHb-free faeces extraction specimens collected in-house were divided into five (5) groups of 20 each. The five groups of extractions sample were spiked with hHb at the following concentrations: 0, 37.5, 50, 62.5 and 2,000ng hHb/mL. The specimens were blinded and tested with Hemosure® One Step Immunological Faecal Occult Blood Test at a Physician’s Office Laboratory and a Reference Laboratory. The results obtained from the POL site, by persons with diverse education background and work experience, agree 97% with the expected results. The result obtained from the Reference Laboratory agreed 99% with expected. Overall, the accuracy of Hemosure® One Step Immunological Faecal Occult Blood Test is 97%.4. Comparison Studies: Fifty (50) specimens were also tested in-house with Hemosure® One Step Immunological Faecal Occult Blood Test and a predicate device. The correlation between Hemosure® One Step Immunological Faecal Occult Blood Test and the predicate device was over 99%.